Last night I attended the Shabbat service at Temple Mt. Zion (@mountziontemple), where Professor Amy Jill Levine spoke for almost an hour on why Jesus is important to Jews and why the fact that Jesus was Jewish is important to Christians. It was an excellent service and lecture sponsored by Mt. Zion and the nearby House of Hope Presbyterian Church (@HouseofHopePres). The service was attended by folks from both congregations. For those who are unfamiliar with Prof. Levine's work, she is a professor of New Testament Studies and a Professor of Jewish Studies at Vanderbilt. Her most popular books are The Misunderstood Jew and The Jewish Annotated New Testament. As a Jew who studies the New Testament, she is comfortable and familiar with both traditions. Her talk was informative as she did what she does best; that is, to demonstrate the relationship between the traditions. She spoke about the Jewishness of Jesus' teachings, story telling style, and even wardrobe. Her talk was hiliarious at times, as she was able to allow the Jews to laugh at the Christians and vice versa. Some of the most funny comments were when she was telling about how, at seven years old, she chose to attend Catholic catechism classes because she wanted to figure out why some Christians had a problem with Jews. Temple Mt. Zion and rabbi Adam Spilker are very involved in ecumenical concerns, which is why they are so welcoming to my St. Thomas students. I always take my Hebrew Bible students there near the end of the semester. In addition to the service, I like to show my students the fantastic art collection that Mt. 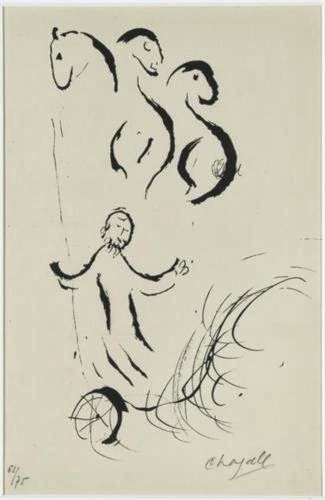 Zion has and, of particular interest, are two prints by the Russian Jew, Marc Chagall. 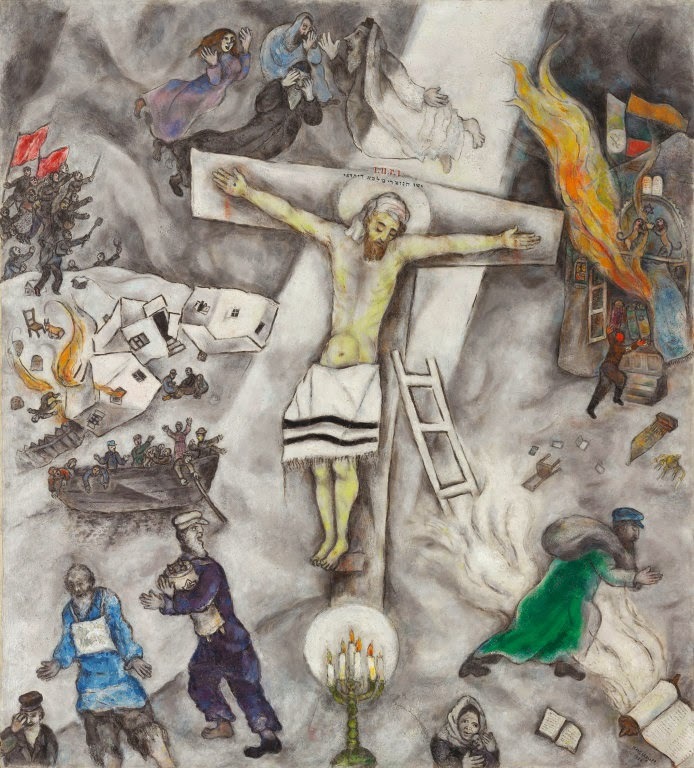 When talking about Jewish Christian dialogue, it is Chagall that is at the forefront of my mind. There is another work in which the crucifixion of Jesus is used as a way to understand the suffering of Jews, a novel by Chaim Potok called My Name is Asher Lev. In the novel, a young artist scandalizes his conservative family when he paints a crucifixion. I am very glad that St. Thomas is very involved in Jewish Christian ecumenism. The Jay Phillips Center for Interfaith Learning has a visiting rabbi and works hard on Jewish-Christian dialogue.